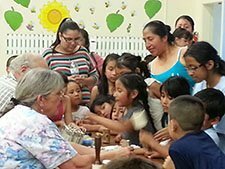 Your gift will go directly toward helping Downtown Languages fulfill our mission of increasing opportunities for immigrants and building respect and understanding across cultures through language, literacy, and other educational programs. $250 allows six students to attend U.S. Citizenship courses as many times as needed until they feel prepared to pass the exam. 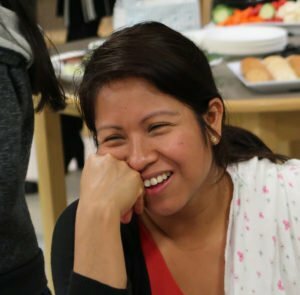 $100 provides an entire 5-week session of Bilingual Computer classes for two students. $50 covers the full cost of a 5-week session of ESL classes for one student. BY MAIL—Send a check payable to Downtown Languages to: Downtown Languages, 532 C Street, Springfield, OR 97477. PAYPAL—Make a one-time or recurring monthly donation with your credit or debit card. MATCHING GIFTS—Your gift to Downtown Languages could be matched dollar for dollar by your employer! Many employers sponsor matching gift programs and will match any charitable contributions made by their employees, retirees and/or employees’ spouses. Check with your employer to see if there is a matching gift program you can participate in. TAX-FREE FROM YOUR IRA—If you are age 70 1/2 or older, you can make a “qualified charitable distribution” directly from your IRA account to Downtown Languages and satisfy all or part of your required minimum distribution, reducing your tax liability. Speak with your financial advisor or brokerage firm. Most are happy to assist you and only require that you provide the name, address, and Tax ID of the charity you wish to donate to. 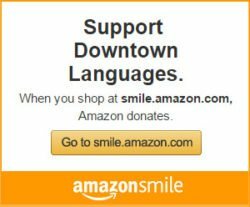 Downtown Languages is a 501(c)(3) organization and donations are tax-deductible. Federal Tax ID number: 20-0646954. Become a sustainer! Support DTL throughout the year with a monthly contribution.